When couples get married, they are usually in a very jovial mood. Going on vacation trips and engaging in leisurely activities are a normal part of their newly married life. However, after some time, most couples start becoming engrossed with their individual jobs. They also end up being too busy with fulfilling responsibilities in the family. There is nothing wrong with being a responsible husband or wife and there is nothing wrong with doing your job. But, you should understand that there should always be a balance in your lives. This balance is essential to keep yourselves from stressing over married life. And exactly how do you attain this “balance”? Through playtime of course! No One’s Too Old to Play! Do you think that you’re already too old to go out and have some fun? Do you feel that you are now mature people who need to sustain a family? If this is the case your relationship may be in deep trouble in the near future. Why is that so? Simply because there’s a big chance that both of you will be stressed out because of the duties that you have to fulfill in marriage and family. Keep in mind that “all work and no play” is bad for both of you. There’s no such thing as being too old for fun. The fun factor acts out as the balancer in your marriage. It allows you to get rid of all the toxicity that married life brings to you. Having fun is also needed to bring back the fire to your relationship. You wouldn’t want to wait until all emotions are dry before you ignite it again would you? A little bit of fun refreshes both of you. This can help in re-establishing how you felt when you fell in love with each other for the first time. Many people develop heart problems and other stress-related illnesses. Having fun with your spouse can be helpful. It can help you both maintain a healthy life. Remember the saying “Laughter is the best medicine”? Well, that is truer than you may think. Want some ideas? Below are some of the ways where you can de-stress and simply have fun as a couple! Watch a Movie – Watching movies can be a great pastime to relax and bond with each other. It doesn’t matter whether you’ll be watching in the theater or renting from the video store. The important thing is that you’re together to relax and enjoy! Don’t Kiss Dating Goodbye! – Who said only young couples are allowed to go on dates? Married couples can go on dates too! Taking time off from the family and spending a special dinner together, just the two of you, is a great way to bond with each other. Why not try going to restaurants that both of you have never tried before? This can be a pretty interesting experience for both of you! Have a Picnic – Pack some snacks and drinks. And head to your favorite spot for a romantic picnic. It can be lakeside, beach, or even in the woods. While enjoying the food, both of you can talk about the past and the future. Talk about silly moments both of you have had and have a good laugh at the same time. To make it even more fun, why not give a massage to your partner in the open! Play Tourist! – If you’re not in the position to splurge on a vacation, then you can simply pretend that both of you are tourists in your own town. You can go to places that you have never visited before. You can also try visiting cities just near yours and see the attractions they have to offer. Take Classes Together – Nobody’s ever too old for learning, which is why another way of having fun would be by taking classes together. Do something that can interest both of you. Why not take ballroom dancing lessons? There’s also the chance of learning a new language. You can also learn how to play an instrument. You can opt for trying extreme sports such as bungee jumping or sky diving. There are a lot of things that both of you can learn together! This is one good way of spending quality time with each other and at the same time having fun! 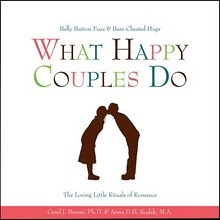 You can find even more ideas on how to have fun with your partner in What Happy Couples Do. In this light-hearted book, more than 50 real couples share their ways (most of them silly) of how they have fun. For old-timers, any ideas you pick up from this book will give your marriage the much needed boost.